If the smaller-motored bike is any slower than the bigger Z, you’d be hard pressed to tell anywhere up to 6000 rpm or so; the Z900 feels to have more low-rev torque than the 1000. Could be just the reduced weight at work… but this bike has tons of power right off idle and a nice light clutch that makes it easy to deploy. We’ll have to get to the dyno to get the full scoop, but a lack of power feels like it’s going to be the least of the Z900’s problems (if it has any). Furthermore, as Roderick observed, this is one of the smoothest-running Z naked bikes Kawasaki’s ever produced, with barely a tingle coming through the bar at 5500 rpm and 80 mph. The bike’s scooped-out seat makes it easy to hang on at that speed, and its low height makes this Z accessible to sawn-off persons too. Stylewise, you make the call, but to most of us (including the resident millennial), the H2-inspired green steel frame wending its way through tastefully molded plastic, is a tremendously understated hit. 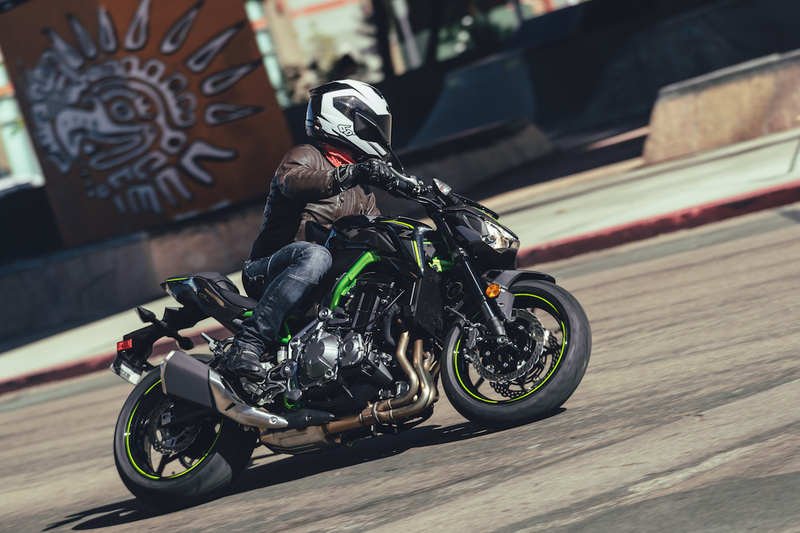 Stay tuned for a Standard comparison, and don’t bet against this new Z900 winning it. No one can keep track of all the MOBO’s the smallest FZ has received since its 2014 introduction. What, only three? 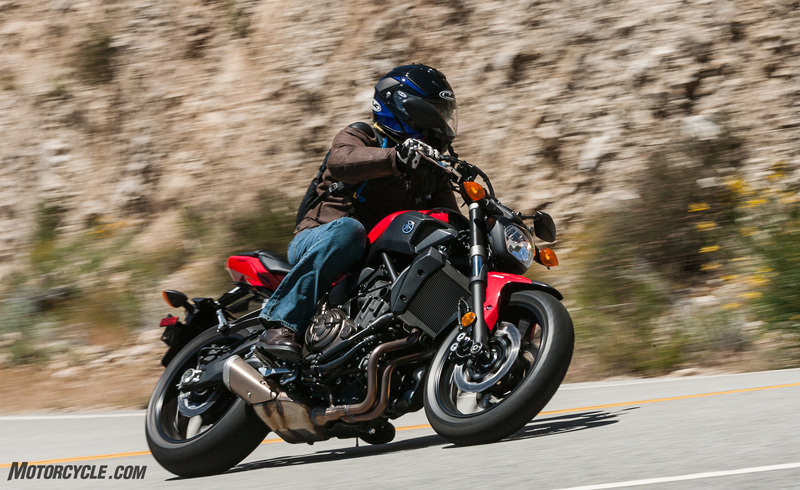 I think it’s more, but for sure the -07 has been named “Best Value” for the last two years running, and it was runner-up to the nearly twice-as-expensive BMW R nineT for “Best Standard” in its debut year. The others keep trying to knock the FZ off its pedestal, most recently Kawasaki with its new Z650 and Suzuki with its updated SV650… but nobody’s dislodged Yamaha’s excellent little Twin from its top spot in our prefrontal pleasure lobes yet. The only news for 2017 is availability of a new ABS model, for a mere $300 more – $7,499. Besides that, the original scrappy little honey badger FZ-07 continues to hold the line: That 689cc parallel Twin mit Crossplane Crank still produces class-winning torque (even if the new SV650 has a couple ponies more on top) and soulful sounds. 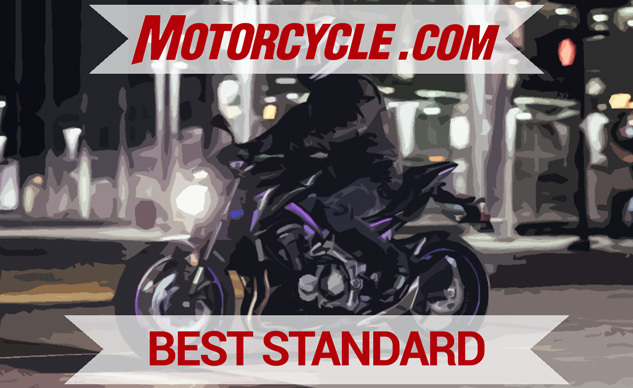 Its quick-handling chassis, big-boy tires and brakes, and the rest of the very well-thought out package continue to make it a great lightweight sportbike, excellent commuter, and pretty much everything in between. I, I feel a motojournalism cliche coming on and I can’t resist: Make mine red!